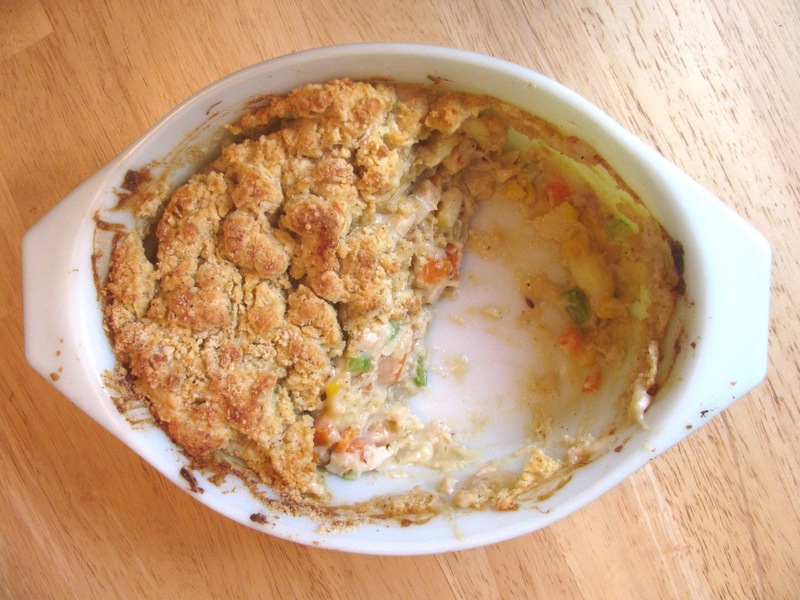 This is, hands-down, my favorite chicken pot pie iteration we have ever had—and also one of the easiest and healthiest! I changed up the original recipe a little bit; I halved it so that it was more suited to two people rather than a whole family, and I also replaced about half of the called-for chicken with potatoes instead (because I didn't have enough chicken, and as Mahon says—what kind of fool makes chicken pot pie without potatoes, anyway?). I'm including the original proportions of the recipe here, but with my other alterations. Like any chicken pot pie, this really could be done with any veggies you have on hand. In a medium saucepan with just enough water to cover the potatoes, boil potatoes until they are almost (but not quite) ready to eat. While potatoes are boiling, prepare other vegetables. Once everything is ready, preheat oven to 400. Sautee all veggies together in a large skillet or medium saucepan with olive oil, about five minutes (or until the veggies are beginning to brown). While veggies are cooking, get started on the crumble topping. Combine flour, baking powder, salt, pepper, and cayenne/chili powder in a medium bowl. Cut in butter with pastry cutter or fork. Stir in parmesan cheese. Add cream/milk and stir until just combined. Once the veggies are done cooking, remove and put into a casserole dish, along with the chicken. In the same large pan you used to sautee the veggies, melt butter. Add flour and stir to combine, then add broth. Stir until everything is smooth. Add milk, salt, and pepper, and cook over medium heat, stirring frequently, until sauce begins to thicken. Stir sauce into casserole dish with veggies and chicken. Break topping dough apart with your fingers and sprinkle as evenly as possible over top of casserole. Bake at 400 for 15-20 minutes, or until topping is browned. Serve immediately. Try not to eat the whole thing. I'll have to try it to compare to the recipe we are in love with now--that Jenna says is her very favorite meal. And yes on the potatoes. What recipe is that? Is it the one that you gave me when I got married? Because I have to say... I do like this one better!